This article looks at the issue of leadership within three multilevel contexts. The first context relates to the developmental context of leadership as a process of ongoing growth through various stages. This context focuses on things such as values, cognitive capacities, interpersonal skills and all those abilities that mark off the requirements of effective and authentic leadership. 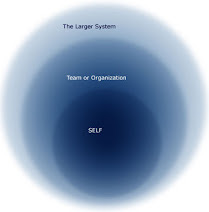 The second context relates to leadership as it exists in its relational and embedded forms throughout the whole organisation. This view sees the leader as a reciprocal role of leader-follower. It emphasizes the socially nested nature of organisations and organisational decision-making. The third context considers the issue of power regulation and broad governance within an organisation and how leadership manifests that from the aspect of organising. These three lenses provide their own unique window into the complex world of leadership. Because these views are multileveled they can be represented as holonic systems, that is, as multilevel systems of part-whole relationships. The developmental view sees leadership as a temporal process of including former stages of human development within later stages. This developmental lens looks at how “the leader” develops over time and with experience. The socially-nested or ecological view sees leadership as the network of leader-followers embedded within structured organisational settings. I am using the word ecological here in the sense of human ecology, that is the study of human groups in their social environments. And thirdly, the governance lens sees leadership as a functional process of leader-followers embedded within a system of power, decision-making and regulation. Governance refers to more than just executive or board governance, but to the whole system of self-regulation and decision-making that occurs throughout an organisation. These three holarchical views of leadership have much in common and yet are very different in their explanatory focus. These similarities and differences give rise to many confusions and conflations between these three explanatory lenses. 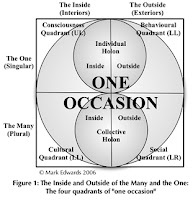 This paper discusses i) divergences and convergences between these three lenses, ii) common forms of confusions that have been associated with these three lenses, iii) how these three views might be combined to describe more comprehensive meta-theoretical frameworks for exploring organizational leadership. MARK EDWARDS PhD. is a registered psychologist with a Masters degree in developmental psychology and a PhD (awarded distinction) in organization theory from the University of Western Australia. He currently teaches business ethics at the Business School, University of Western Australia and metatheoretical studies at John F. Kennedy University in California.